CD Genomics has developed advanced Immune Repertoire Sequencing strategy to amplify and sequence the immune repertoire with Next Generation Sequencing (NGS). Now, we are providing comprehensive solution to evaluate the diversity of immune repertoire precisely in a cost-effective way by pooling the samples. Adaptive immune system play an extremely important role in counteracting against infectious pathogens and shielding the human body. The foundation of the adaptive immune system is fundamentally reliant upon the enormous diversity of T and B cell receptors (TCRs and BCRs) that can recognize epitopes from an astronomical number of different exogenous antigens and endog­enous host factors. Immune repertoire is known as the collection of functionally diverse B and T-cells in the circulatory system, which is a key measure of immunological complexity. The study of Immune repertoire is crucial to understand the response of adaptive immunity, and ultimately, sheds light on the discovery of novel infectious agents and holds invaluable potential to aid in antibody or vaccine development, clinical diagnosis, treatment, and prevention. The tradition strategies for studying the immune repertoire, which includes spectratyping, Sanger sequencing et al., are laborious, costly, and are insufficient for generating a high-resolution picture of the immune repertoire. NGS offers a powerful approach capable of analyzing the immune repertoire in a high-throughput manner. 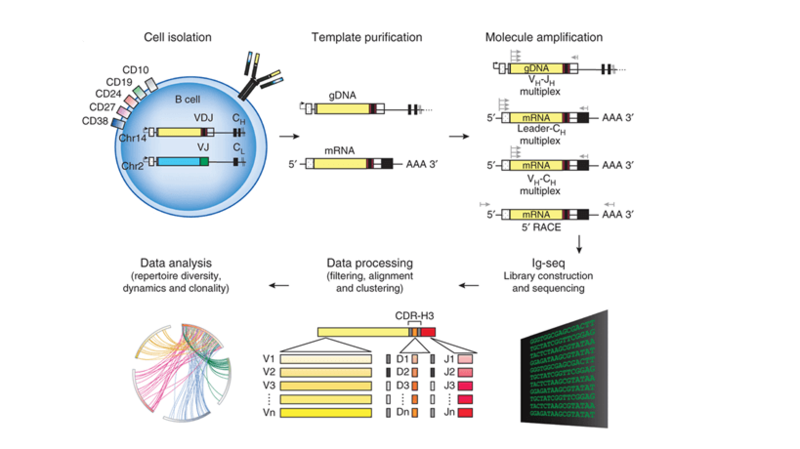 By providing enormous sequencing data, NGS has create an unprecedentedly high-resolution picture of the immune repertoire, which provides great potential for revealing dynamic changes in clonal populations during antigen stimulation. Our Immune Repertoire Sequencing strategy is to capture the complimentary determining region (CDR) of B-cell receptor (BCR) or T-cell receptor (TCR) using multiple-PCR or 5’ RACE methods, followed by deep sequencing. The workflow for the strategy is illustrated in the Figure 1. Figure 1. Schematics of steps for high-throughput sequencing of the Ig sequence repertoire (Georgiou et al., 2014). Georgiou G, et al. 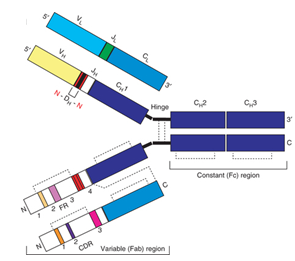 The promise and challenge of high-throughput sequencing of the antibody repertoire. Nat Biotechnol. 2014, 32(2):158-68.